At NuFlow Phoenix, we work tirelessly to provide Arizona customers with the most efficient trenchless repair services possible. Our company services the areas of Scottsdale, Paradise Valley, Tempe, Arcadia, Mesa, Chandler, Gilbert, Glendale, Tucson, and Sun City. We specialize in state-of-the-art plumbing technologies that leave every valley customer with long-lasting and satisfied results. The services we offer at NuFlow Phoenix are always environmentally friendly and affordable. We are supported by our commitment to customer satisfaction through careful attention to detail and our industry experts that are ready to service you every day of the week. Our team at NuFlow Phoenix is caring and attentive ready to assist your residential, commercial, or municipal property with innovative trenchless technologies. We make sure that we are available our customers no matter what their sewer and drain problems are. Valley customers can always rely on us to provide them with quick and reliable trenchless repair and replacement services that demonstrate our professionalism when dealing with your home or business. Before our team establishes what kind of trenchless service needs to be done on your drain or sewer system, we need to evaluate what is going on within your pipes. Playing a guessing game of where your problem is occurring within your pipe system is not time effective nor is it cost effective; the longer you let a problem go, the more serious it will become. Sewer camera inspections are the most important part of our trenchless repair or replacement process because it provides our team with a real-time view of the interior of your pipe. The inspection begins with our team finding the cleanout hole on your property. A clean out hole is a pipe fitting that can be opened and closed to access the drainage system of your home or business. If for some reason we cannot locate the cleanout hole on your property one of our technicians will dig a strategically placed hole above your drain to establish an access point. After the access point has been established, we will insert a high-resolution waterproof camera into your pipeline. The camera is attached to a sturdy but extremely flexible rod that can move with ease through your pipe sytem. As the camera moves through your pipes, it will provide us with a crystal-clear view of your pipe’s interior revealing any clogs, cracks, leaks, blockages, calcified buildup, or tree root invasions. When the exact problem has been identified, our NuFlow team will come up with the best solution for you and move on to prepping your pipes for repair or replacement. At NuFlow Phoenix, we want to make sure that your drains are properly prepared for any trenchless service we perform. The leading drain cleaning service used in the plumbing industry is hydro jetting. Hydro jetting is a drain cleaning service that utilizes clean water to completely flush out your drains. The process begins with a technician placing a hose with a multi-directional nozzle inside of your pipeline. When the hose is securely in place, high-pressure water is sprayed inside the pipe in all directions to clear debris and buildup. The water pressure is controlled by a trained expert and is powerful enough to clear calcified clogs and tree roots but not strong enough to damage your pipe’s interior. Hydro jetting is not only a service to be performed when pipes need repair. Hydro jetting services can be relied on year-round to ensure your sewer systems health and extend their lifespan. Our team at NuFlow Phoenix is comprised of industry experts in trenchless technologies. Trenchless repair and replacement allow us to restore pipes in whatever ways they need without digging harmful trenches across your property. Cured-in-place pipe (CIPP) or trenchless pipe lining is quick and easy process that takes a few hours to repair your pipes versus a few days or weeks. The CIPP process uses the same cleanout hole that was used during your pipe inspection and cleaning. 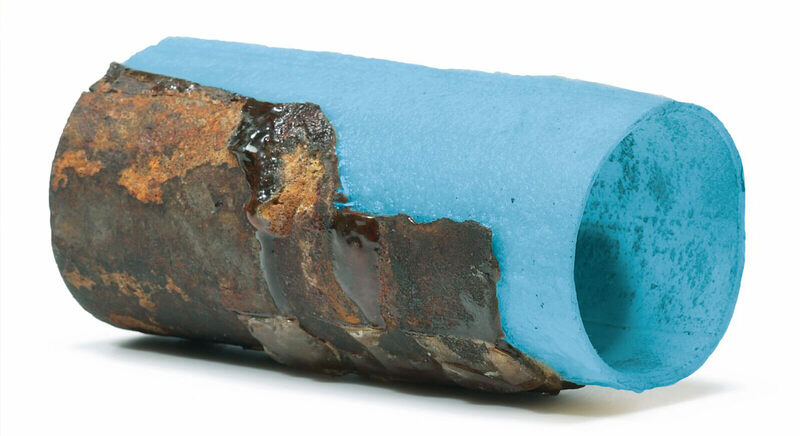 CIPP involves a felt sleeve coated with epoxy to be pushed through your pipes. As the sleeve pushes against the interior walls of your pipe, they coat it sealing all imperfections. The epoxy is left to harden for a few hours (or 60 minutes if heat is used). When the epoxy is done hardening there is a brand-new pipe that has formed inside of the existing pipe. Trenchless pipe lining can be done to a variety of pipes such as cast iron, orangeburg, concrete, and PVC. Trenchless repair services leave your property in pristine condition making it worth the money. CIPP is an extremely reliable sewer and drain repair service, but if a sewer camera inspection reveals a collapsed pipeline, your pipe will need to be completely replaced. Past methods of sewer replacement gave customers a bad taste in their mouth due to time it took to repair the drain, the damage it caused to their property, and surprise fees at the end of the process. Trenchless pipe bursting eliminates all of those issues allowing our team to service your valley home in the most productive way possible. Pipe bursting involves attaching a new pipe to a special bursting head. The bursting head size will vary depending on the diameter of the pipeline. The bursting head is able to move through existing pipes carefully and cautiously pushing the pieces of the old pipe into surrounding soil. When the bursting head has moved all the way through your pipes, it will have replaced your old pipe with a new one. Two access points will need to be established for pipe bursting. One for the new pipe to enter through and one for the bursting head to come out of and to seal the new pipe to your system with heat. Conducting the bursting at the same time as replacing allows for this to cut down our work time and restore your system in an efficient manner. Some home and business owners are still under the impression that lining your pipelines is not as effective as replacing your pipelines altogether. The truth is that both offer valid solutions for your residential, commercial, or municipal property in Arizona. The versatility of trenchless pipe lining allows customers to have individualized costs based off of their own needs and what they can afford. Every valley property is different which means that every structure will have its own unique needs and constraints that determine how much trenchless repair or replacement services will cost. There are a variety of things that need to be factored in when exploring the cost of trenchless services. What type of property needs repair? No property is exactly the same whether it is a townhome in Tempe or a hospital in Phoenix. At NuFlow, we service a diverse range of properties, so we can assist valley customers and provide them with the most cost-effective service. Residential properties are generally smaller scale sites which means they have smaller sewer and drain systems. Residential properties often run into a variety of issues like hair clogs in the bathroom shower drain or food blockages from the garbage disposal. Commercial properties are medium scale and are often located in places where sewer and drain systems intertwine with other systems or they are shared between facilities. Commercial buildings can have issues that range from buildup in grease traps that stem into the pipelines to chronic clogs like tree root invasions within the sewer or drain pipes. Municipal properties are a bit different because they can either be the city’s responsibility or they are the residential or commercial property owner’s responsibility. Municipal properties also include roads that could be above pipes that need repair. If not checked on or repaired, they could cause larger issues within a city that is time consuming and costly. The type of property that requires trenchless repair will determine how much of your pipe needs repair. If you have an older home or business or even live in a historic town, your sewer and drain system could be older than most and need a full upgrade. In addition, if you just need a small section of your pipe repaired or replaced that will significantly bring down the cost of your service. How accessible is the pipe? The accessibility of your pipe is a vital aspect of the repair process because trenchless services require access to cleanout holes or our technicians will need to be able to create an access point themselves. The access point will be easier or harder to make depending on the type of ground they are working with. The location of your pipe could be under a driveway, busy city road, garden, or parking lot. Establishing the difficulty of creating an access point is going to be a big factor in the cost of your repair. Creating a small access point in a backyard with soft soil and grass will be much different than having to drill through concrete to access the pipeline. What is the diameter of your pipe or pipes? Diameters of sewer and drain pipes depend on the type of property that needs to be serviced. The smallest diameter of a pipe is about three quarters of an inch and larger pipes could be about 24 inches and beyond. Smaller pipes are usually inside the walls of a house or serve a smaller outdoor system whereas larger pipes are made for mainlines that serve larger areas. What are the conditions of your pipes? Through the sewer camera inspection performed at the start of every visit, we can establish the age of your pipes and see how much buildup has occurred over time. If your pipes are older it could mean that they are not as durable as newer pipe systems. What pipe materials is your sewer or drain system made from? Polyvinyl Chloride Pipes (PVC) are plastic and they do not rust or corrode over time. They are very good for residential sewer systems or vent stacks. They are primarily used for the main water supply systems and they are great for carrying high pressure water. The only issue with PVC is that it does not handle water well, but they are a cheaper material. Iron and copper pipes have been widely used for several decades. They are not prone to leaks and remain durable throughout their usage. They have a long lifespan and work well with hot water. These pipes are on the pricier side and in some older home do contain led. Clay sewer pipes are environmentally friendly because they are made out of organic materials. They are not affected by acids, so they are primarily used for sewer drains. They are hard to work with because they are heavier than most materials. Clay pipes are more susceptible to root intrusions and leaks. Even though it is difficult to give customers a universal price for trenchless repair services, there are some ballpark costs that factor into the overall total. The price of pipe lining typically ranges from $85 to $150 per foot, but it can also range from $4,000 to $20,000 for larger sewer lines. These are rough estimates and the aforementioned factors will greatly impact the price of your service. Our industry experts at NuFlow service Arizona customers with precision and speed. The cost of trenchless repair includes the pipes that need to be serviced as well as the pre-repair inspection and cleaning process. At NuFlow Phoenix, we will always make that that you receive the most reasonable priced trenchless repair service. We want to work with you to make this a stress-free process that does not break the bank. Our team specializes in environmentally friendly techniques that make customers feel safe. We are eager to assist our valley customers with trenchless repair and replacement services that leave them happy and satisfied with their results. If you are experiencing a leaking drain or flooding yard, our team has the tools and materials to solve your problems. The only way to know an exact estimate is to call our NuFlow Phoenix team today! Reach a qualified support representative by filling out the form below or calling us directly at 480-508-6634 and we'll be happy to assist you with all your plumbing repairs.